Objective: To keep the ancient art of hide tanning alive by bringing together community members and visitors to work together in a cultural camp setting. Description: The Łútsëlk’é Women’s Group hosted the fourth annual hide tanning camp on the shores of Tu Nedhe, a short ride from the Dënesųłiné community of Łútsëlk’é, in June 2017. Approximately 50 people from across the North of all ages, genders, and cultural backgrounds attended the camp to work on hides or support the tanners. The camp is a wonderful opportunity for people of all abilities to learn how to tan a variety of hides using traditional methods. Elders on site act as instructors and advisors. In addition to hide tanning, the camp featured drum making and hand games. ​Objective: To provide grade nine students with an opportunity to spend time on the land to develop/strengthen canoeing and camping skills. Description: In mid-June, nine students in grade nine at PWK High School in Fort Smith paddled the Hornaday and Slave Rivers, ending at Fort Fitzgerald. Over the course of the three-day trip, the students, with the help of a local guide and their teachers, learned different canoe strokes, communication signals, and wildlife safety. Perhaps most importantly, they learned how to travel safely in moving water and in a range of environmental conditions, encountering everything from calm water to stiff headwinds to small rapids to choppy waves. All of the students took part in camp tasks such as cooking and cleaning; gathering wood and maintaining the fire; and hauling water. Evenings were passed by the fire telling stories. ​Successes: The canoe trip was resurrected this year to fill a gap in on the land programming for grade nine students at PWK. It builds on land-based skills learned in earlier grades, such as setting up camp and building fires, while also providing students with minimal paddling experience the opportunity to learn how to safely travel by canoe. Students were proud of their accomplishments on the river from paddling into a headwind to making delicious food. They were also grateful for the opportunity to spend time together as a family. activities in a camp setting. Description: Sahdeh was a three-week cultural immersion camp near Behchokǫ̀. 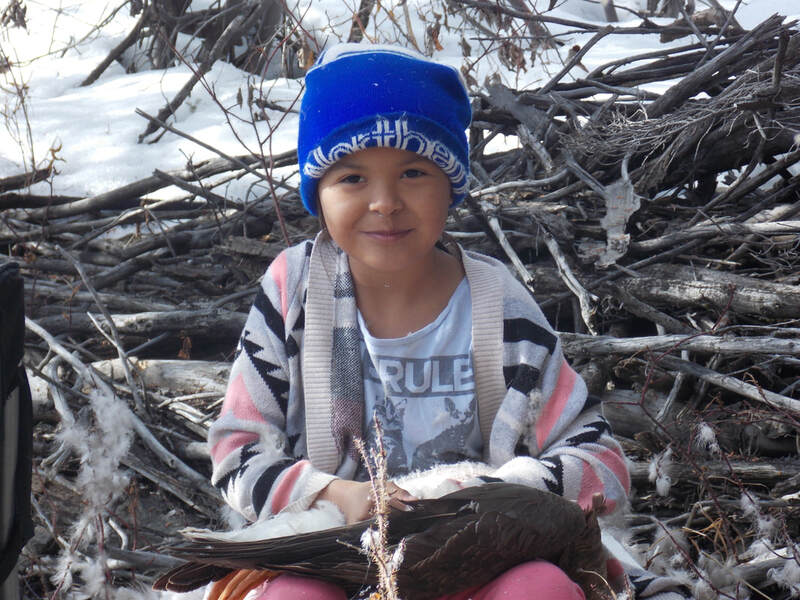 Tłı̨chǫ youth aged 8-23 learned about all aspects of living on the land including setting up and maintaining camp, harvesting and processing fish and animals, and boat safety. In addition to learning survival skills like wildlife awareness and dryfish making, youth participated in cultural activities like sewing, traditional games, and storytelling. The camp also provided participants with opportunities to develop leadership skills and to work together. Successes: In addition to having fun in the outdoors on a regular basis and spending time with their friends, participants in the program learned important skills like how to read a map and compass and how to manoeuver a kayak. For children in the community, Nature Club is a welcome complement to the sport activities already on offer in Hay River. Nature Club is also an example of a successful partnership between three organizations that ensures quality program is available for Hay River youth. ​Objective: To create an opportunity for youth to build relationships with each other, Elders, and the land. Description: Though the week long camp was cut short by weather, youth participants still had lots of opportunities for learning. They learned from the Elders about where they are from and how to integrate themselves into the environment. They worked alongside the local AAROM Coordinator and university researchers to gather data and samples for a fish monitoring project. A geocaching activity was the perfect way to learn how to use GPS, while waste sorting activities familiarized them with the community’s new waste management system. ​Successes: The youth enjoyed their time with the Elders, learning more about their childhoods and families. Working alongside the researchers introduced the youth to some of the projects currently underway in the community and gave them an opportunity to engage with and ask questions about these initiatives. They also learned new skills. On top of all of this, they had fun! Objective: To offer land-based culture camps that will support community members in leading healthy and resilient lives. Description: Thirty-six community members participated in the program, which took place at a bush camp 130km from the community; 21 were full-time participants. The camp took place during the yearly spring hunt, so participants had an opportunity to learn more about harvesting animals from Elders and knowledge holders. Participants also worked on moose hides, processed beavers and ducks, and made dry geese. Part of the time was spent at a satellite camp. Morning prayers, nightly sharing circles, one-on-one time with Elders, and drumming were also important parts of camp life. ​Successes: The community as a whole has made a commitment to being healthier; the camp has been important in working toward this goal. The camp gave participants an opportunity to abstain from drugs and alcohol. While that was very challenging for some, none of the participants quit. Some of the youth who participated in the camp have left the community to continue their healing journey through treatment programs. Since the camp, there are more students in school and more community members of all ages participating in sharing circles and support groups. Objective: To provide opportunities for students of all ages to be immersed in traditional Gwich’in culture and land-based practices. Sun Project) is a series of land-based activities tailored to students of different ages. In June 2017, a group of grade 7-12 students travelled up Teetł’it Gwinjik (Peel River). They learned: about spring water travel; how to identify and gather medicinal plants; how the seasons and time of day dictate hunting and trapping practices; traditional place names; and survival skills. 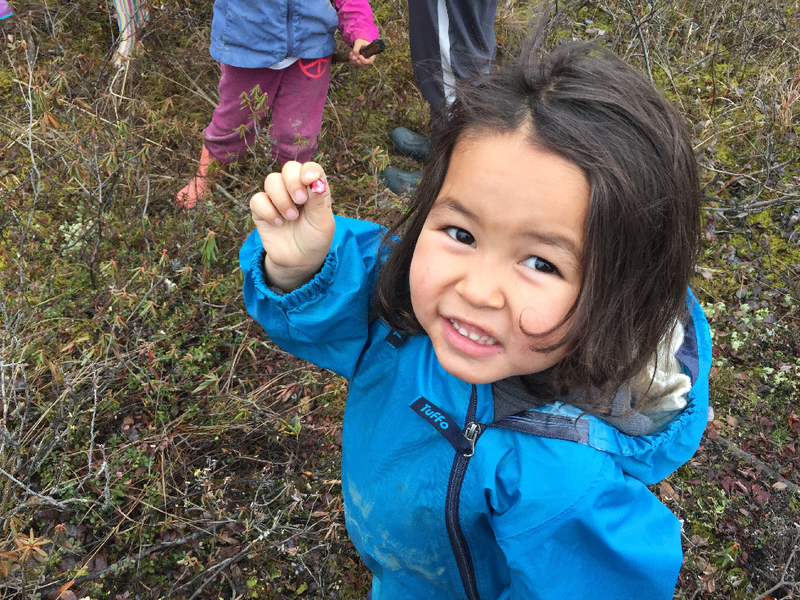 In September, day camps for the younger grades gave students opportunities to: work with moose meat and hides; pick berries; gather medicines; and listen to stories from the Elders. also deepened their understanding of the land through different hands-on activities. Time with the Elders is important for all of the students’ mental and emotional wellbeing. Nitso Nankat Tr’iqwandaih, which employs local land-users and Elders, strengthens the school’s ties with the community. Being on the land also contributes to strong working relationships between the students and teachers.